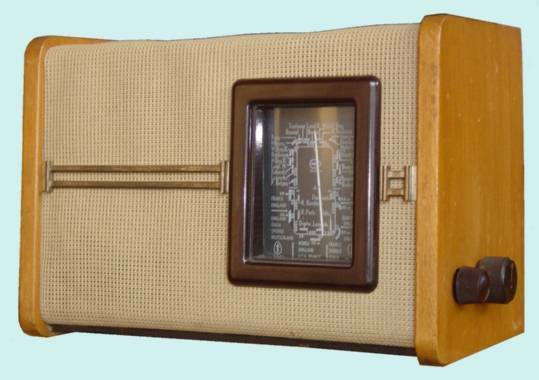 This radio is produced by NSF in The Netherlands in 1945-1946 under a Philips license and is electrically equivalent to the Philips model 208U. However, the cabinet is different (material is wood, whereas the original 208U is constructed from bakelite). Interesting feature of this radio is that the dial is depicting a rather special radio station: "Herrijzend Nederland", a Dutch station that was founded after the liberation of the southern part of the Netherlands in September 1944. Herrijzend Nederland started its transmissions on October 3, 1944 in Eindhoven and closed in January 1946. During the period October 3, 1944 till July 11,1945 the transmitter in Eindhoven was active, initially at a wavelength of 420 meter and later at 435 resp. 437 meter. Only these wavelengths can be found at station dials. After July 11, 1945 the programs were still made in Eindhoven, but transmitted elsewhere at other wavelengths (not depicted at station dials). 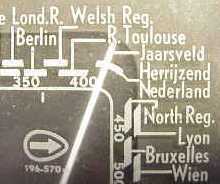 Detail of dial, depicting station "Herrijzend Nederland" at 420 meter. 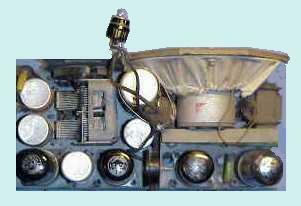 The NSF model H. 54U is an example of a radio using the following set of tubes: UCH21, UCH21, UBL21 and UY1N. Some collectors call such a radio a "European 4-tube" or the "Four Tube Circuit". This radio is in the collection of the RAM (Radio Amateur Museum) in Reusel (NL) now.